Quantum Design’s innovative SHGMS system offers high processing capacity in a compact, modular design with fully cryogen-free operation. The self-contained, automated system integrates into your processing stream and can operate continuously requiring only electrical power, compressed air, raw material and water. Multiple systems can be operated in parallel for increased processing capacity and minimal loss in throughput during maintenance. Magnetic separation is a method of removing components from a mixture based on differences in their magnetic properties. It is one of the very few methods that are effective when applied to very fine particle suspensions which usually take the form of a slurry. The separation is achieved by the application of a magnetic field and the creation of magnetic field gradients which result in forces only on the magnetizable particles in the mixture. When flowed through the system the more strongly magnetic particles are captured while less strongly magnetic components are allowed to pass unaffected. The process can be used to selectively extract a desirable product from a slurry. This technology has been extensively utilized in the mining and minerals industries for many decades with most magnetic separators being based on permanent magnets. This type of device is called a "low-gradient" magnetic separator and is effective when applied to larger, more strongly magnetic particles such as the concentration of iron ores. If the applied magnetic flux density is increased beyond 2 Tesla, the device becomes useful down to very fine particles with extremely weak paramagnetic susceptibilities. At higher flux densities the machine’s processing capacity increases. This type of machine is a "high-gradient" magnetic separator and the magnetic field is often generated by a powerful superconducting magnet. Quantum Design's next generation SHGMS system is revolutionary in that it does not require any liquid cryogens to support its superconducting magnet. The elimination of a bulky liquid helium vessel results in a very compact system designed to be used in a modular fashion: a single system can be used on its own and further systems can be added later as additional capacity is needed. Magnetic separation can be a complicated process. 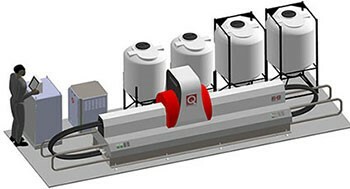 Quantum Design has simplified this process through an intuitive operator interface that guides the operator through setup of all the parameters required for magnetic separation. 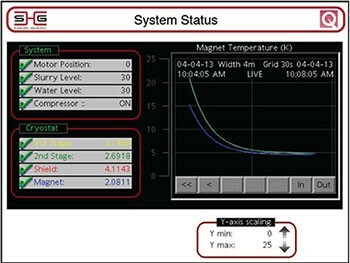 It monitors the magnet cool down sequence, and, once processing has started, provides feedback to the operator on the status, timing and overall state of the system. The Quantum Design SHGMS system features two independent processing canisters which are switched in and out of the magnetic field. One canister processes material inside the magnetic field until it is fully loaded with magnetic components while the other is cleaned simultaneously outside the magnet. The canisters are then exchanged automatically so that the clean canister moves inside the magnet and begins to processes material while the loaded canister is cleaned outside the field. This sequence repeats and results in continuous processing. 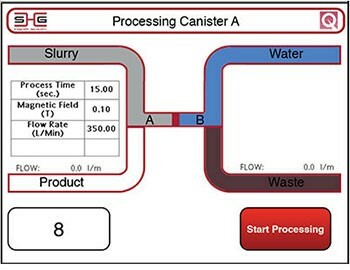 As shown in these examples, the graphic user interface depicts the processing sequence through color changes to inform the operator which canister is being processed inside the magnet, and which one is being cleaned. Process control and monitoring is done through a simple graphical user interface. As shown in the first screen shot, a grey color indicating slurry is shown in Canister A (left side), with non-magnetic product being captured. At the same time, Canister B (right side) is outside of the magnet, the magnetic material is being flushed out with water, and the output is going to waste. 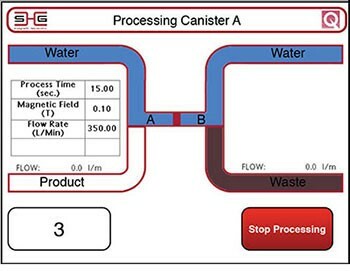 When the processing conditions change, the screen is updated to indicate that water is now flowing into both canisters. The countdown timer on the bottom left corner indicates the time remaining until Canister B moves into the magnet. 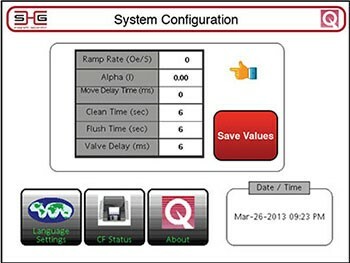 The GUI also provides system status information (left / top) to monitor items such as the magnet cool down. Process parameters are sent to the SHGMS system using the touch screen panel (right / bottom). 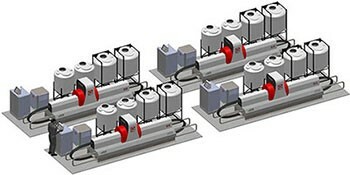 Traditionally, large capacity separation was achieved with single, large capacity separators. A single Quantum Design SHGMS system can process 10-15 million kg of clay each year. This allows mining facilities to incorporate multiple machines to specifically finely tune each system for their needs. This allows for either the ability to increase the amount of clay processed at a mine incrementally, or allow for a single mine to process two different types of clay. Furthermore, a mine that has multiple machines installed can perform maintenance on one machine while the remaining machines continue to process clay. This keeps the decrease in throughput at a minimum.